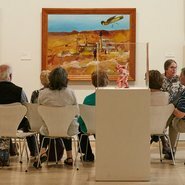 As part of Seniors Festival 2017, this is an opportunity to closely observe paintings by 20th-century Australian artists and to explore Australian stories in a group discussion. Offered to individuals with their carers as well as groups, this tour is particularly for people living with younger-onset dementia. It will provide intellectual stimulation and encourage self-expression with an opportunity for participants to articulate their opinions about what they experience.